Influencer marketing is the marketing strategy where brands reach out to celebrities for endorsing their products. While using influential people for marketing has been there for a long time, in the age of social media, brands use this approach in a much more strategic and cost-effective manner. Today, brands need to reach out to the millennial audiences who find it comforting on social media but not in front of television. Moreover, television and movie ads are very costly and are beyond the reach of small business. Hence business especially SMBs have opted for micro-influencers who have a limited reach but they serve the purpose of the campaign. It make sense to opt for this approach as we are much more responsive to influencer endorsements than an advertisement. Studies have shown that an average person (like us) trust influencers’ opinions almost as much as that of our friends and families. Through this blog you’ll know – who are micro-influencers, why should you hire them and how to find the right ones for your business. Micro influencers are people on social media having 1000 to 100,000 followers. They have credibility in a small social segment but their fans value their opinions. Companies can use the minute influence of such people to reach out to the audience which is hard to target using traditional marketing. Preferably a combination of 10-20 micro influencers can be used to target a good audience size and create engaging campaigns. You can enjoy an amplified reach using the power of social media and influencers. Each micro influencer has a strong say in a niche market. By using their influence, you can amplify your reach to their audiences and maximize your current follower base. Since we usually have many influencers engaging with your brand, it creates virality around your product. Micro influencers charge pennies when compared to the budget of TV and movie celebs. While Kim Kardashian has a huge fan base it makes more sense to leverage the influence of a renowned cloud security expert to reach to CIOs then to approach her to endorse your product. Hence you get a much better ROI from your efforts when you choose these niche influencers. Everybody today is running a PPC advertisement. Even business blogging has become a highly crowded segment. Influencer marketing, on the other hand, is new and exciting. There are possibilities which are yet to be explored and you can easily combine this strategy with other segments of content marketing to create new opportunities. How to Choose the Right Micro-Influencers? The micro-influencers in radar should have a strong authority in the buyer segment that you want to target. The influencer should be able to add to your current audience and amplify your social media reach. There is no point contacting a travel blogger if you want to target techies. The aim is to reach the right customers, make sure your choosen influencer can do that for you. With so many bots in place, it just takes a few bucks to get thousands of followers. The right measure of influence is not the number of followers but the actual engagement triggered by their posts. A good influencer will also post content on a regular basis to keep themselves in the social media limelight. It is conversions that matter the most for a business. The click-through rate on the posts of influencer is a very strategic metric to track in this regard. But it is obvious that many times these social media celebs might trigger purchase by influencing their audience subconsciously. After all, we don’t rush to but a toothpaste as soon as we see an ad but that advertisement influences our buying behavior. Keep both these into account. 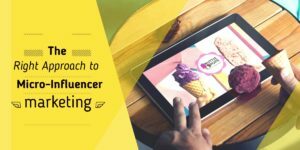 While it seems tempting to hunt for micro influencers with maximum reach, you do need to manage a budget. When you are at an initial stage of a campaign you should start with many influencers. Over time you can drill down to those who deliver the highest engagement. This way you can manage your budget and still select the best match. The personality of an influencer and his/her social media image needs to reconcile with your brand’s image. The tone, character, voice, style, and content all should have a few common grounds so that the audience can think of you and the influencer as a right association. It shouldn’t look like apple and oranges else you’ll lose authenticity and it would look pretentious and fake. Where to find the right micro-influencers? If you are looking for local influencers then Google is your go-to resource. There are ample of directories and roundup posts where you can find the ideal influencers that you should approach. This is the simplest way to find influencers although it is kind of basic. You may not find the right people in case you are looking for a global reach. As soon as you start researching on influencer without a location specific keyword you’ll end up being bombarded with the results on macro influencers. What better place to look for social influencers than on social media itself? Start with a quick study of your current follower base and identify accounts who might be a good match. Next you should research for the relevant hashtags in your niche and finally, you can use filters and advanced search options to drill down on your query. If you need quick relevant results than using tools like Influence.Co, BuzzSumo, InsightPool, HYPR etc. These tools give a quick overview of the relevant influencers and some also allow you to reach out to them from the tool itself. A bright side of using tools is that you get a lot of other metrics like engagement, posts frequency, popular contents etc. These combined offer valuable insights to help you better craft your strategy.